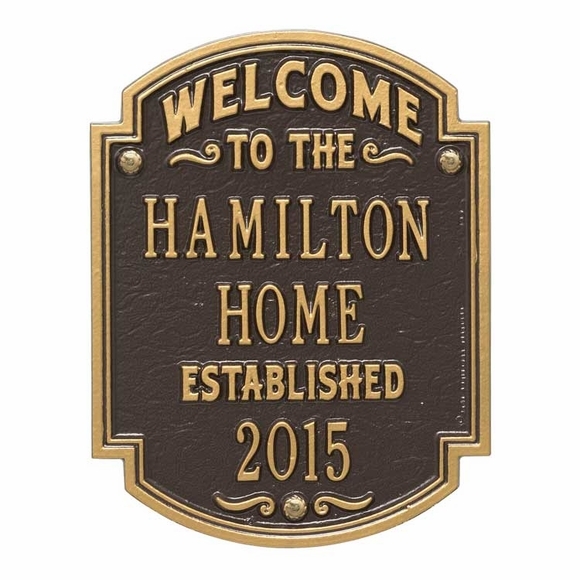 Home Established Welcome Plaque - - 8.5" x 11" personalized welcome sign. Wall mount. Made in USA. This classic and elegant plaque welcomes guests and marks the year in when the house became a home. Double border accents the unique double arch shape. The lines that say WELCOME, TO THE, HOME, and ESTABLISHED are standard and part of this sign's design. Line 1 (Name) holds up to ten (10) 1.25" characters. Line 2 (Year) holds the established year in XXXX format. Large image shown in bronze with gold characters. Smaller images (from left to right) are antique brass, antique copper, black/gold, bronze verde, oil rubbed bronze, bronze/gold, and pewter/silver. Dimensions: 8.5"W x 11.0"H x 0.32". Classic welcome sign displays the important year in when the house became your home. Makes a fine housewarming gift and anniversary gift. This was an early Christmas gift. I love it. Well made, nice finish, and a great addition to the entryway of our home. Everyone so far whose seen it has complimented it.